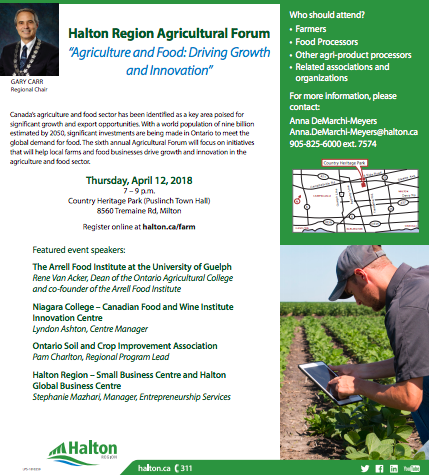 Halton Region’s 6th annual Agricultural Forum is coming up on Thursday, April 12, from 7 – 9 p.m. at Country Heritage Park in Milton. This year’s forum will focus on initiatives that will help local farms and food businesses drive growth and innovation in the agriculture and food sector. It will be of interest to farmers, food processors, other agri-product processors, related associations and organizations, students, entrepreneurs interested in agriculture, and food industries. The Arrell Food Institute is dedicated to transforming global food systems and elevating Canada’s place within the global food economy. Initiatives include the use of big data in agriculture, the introduction of new crops, application of machine learning, resilience of high immune responder beef cattle and much more. Learn more about initiatives being developed at the Arrell Food Institute. The Canadian Food and Wine Institute Innovation Centre offers unique educational opportunities such as wine making and craft brewing as well as a full complement of services to support industry innovation and commercialization of new food and beverage products and processes. Learn how you can utilize these services. The Canadian Agricultural Partnership (CAP) replaces Growing Forward 2, a federal-provincial-territorial initiative that encourages innovation, competitiveness and market development, adaptability and industry sustainability in the agri-food and agri-products sector. Learn how you can take advantage of these and other cost-sharing opportunities. Halton Regions Small Business Centre offers a comprehensive resource centre that includes the tools, training and expertise to help guide businesses. The Halton Global Business Centre provides valuable resources for small to mid-sized businesses that are interested in scaling up and exporting. The event is free, and you can register online at halton.ca/farm.